Created by Eduardo Lucero "LedMirage"
The name for this UI theme "Durin's Folk" comes from Tolkien's lore: Durin is one of the seven first Dwarves, he founded Khazad-dûm (later called Moria after falling to the Balrog), his lineage carries all the way down to Thorin II Oakenshield (The Hobbit) and even Gimli. 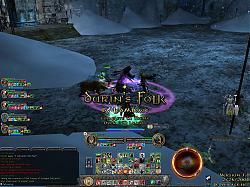 Durin's Folk are also known as the "Longbeards". Every image file used in this theme is original work created by me (LedMirage) using Photoshop CS2 exclusively and I am seriously looking for a way to make a living creating neat stuff for games or anything else creative. I've been doing this as a hobby for more than 10 years. 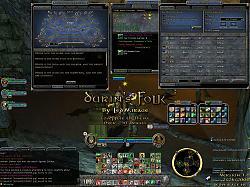 A lot of work has gone into this UI theme during the last ten months including countless hours of testing, I sincerely hope you enjoy Durin's Folk as much as I do, enjoy! 1. New Mini-Map Border Frame graphics for hope and dread levels. 2. New Mail selection graphics. 3. New NPC, Pet and Target of Target Unit Frames. 4. New Group Unit Frames. 5. New Trade Window Background Images. 6. New Player Journal inventory item frames. 7. New Player Journal Character Preview Frame. 8. New Social Panel Player list selection background. 9. Fixed all the distorted UI elements in the theme found in Book 12. 10.Fixed the Quest Journal Background to make it easier to read the light grey text. 1. Version not released publicly. 1. New Unit Frames! This includes your character and all other players and enemy NPC's. Good elite NPC's Unit Frames coming soon. 2. New Hunter Focus and Champion fervor indicators. I'm very happy how these turned out, enjoy! 3. New Trait background images. 5. New Inventory bag slots. 6. New variations with black backgrounds instead of blue by popular request. There are now four variations to choose from. 7. Tweaks and updates to almost everything, a major update! 5. Many other changes throughout. 1. Too many changes to list, a complete revamp of the theme was done, check out the screenshots! 1. Tweaked the bag panel border corners to not overlap with icons. 2. Tweaked the adorned panel corners (the green gems) to not overlap with other panel elements. 3. Remade all the menu and bag mini button borders. 4. Tweaked the combat mode indicator border. 5. Tweaked the drop shadows on numerous graphics. 6. Made the close window "X" button invisible (but it's still there! ), it will appear when you hover over it, this was my only solution to that particular graphic not being consistantly aligned across all panels making it impossible to make a matching graphic that looked good with the angled corners. 7. Changed the tooltip color and shape, corners other than square are not doable with the tooltip border sadly as the tooltip background overlaps them. 1. Added custom menu mini buttons, I put a *lot* of work into these and I'm rather proud, hope you like them! 2. 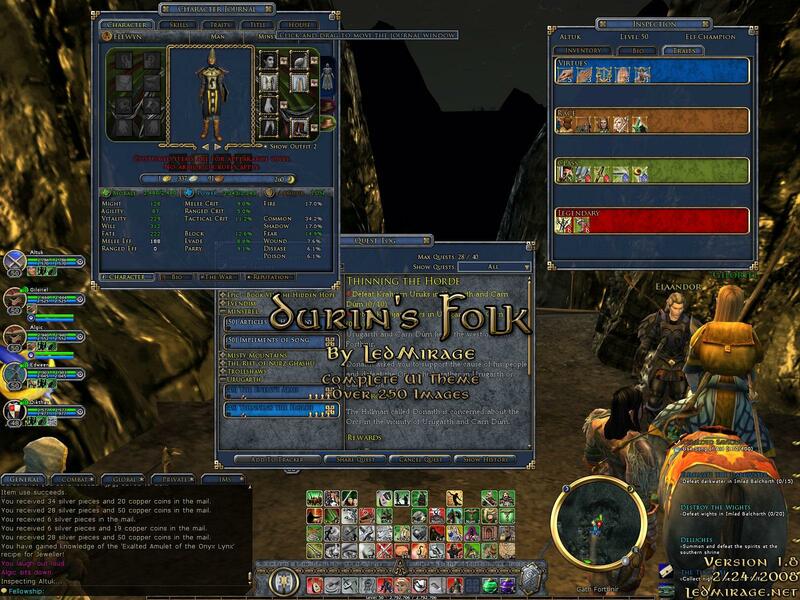 Added custom bag mini buttons, new buttons but default LOTRO bag icons. 3. Added a custom Text Button, this is the button you press throughout the UI, looks quite nice if I may say so myself! 4. Added a custom tooltip border, I wanted to do more with it but there is very little space to work with. 6. Made a tweak to the Titlebar graphics, the shadow dropdown on them was too heavy and I tweaked it to match the window's border dropdown shadow. If you use any of my work, all I ask for is clear acknowledgement of it in any and all of your descriptions and ReadMe files, that's not much to ask is it? 1. You agree to this agreement by downloading and using any and all files and intellectual property included in this software package. 2. You agree to NOT discredit any author of any or all of their original software included be it code, graphics, any other assets or intellectual property. 3. You agree to NOT hold any author responsible for any damage, data loss or any problems caused directly or indirectly by this software. 4. You agree to NOT use any material included for monetary gain, as it is against Turbine's EULA agreement and it is NOT your right to make money off of other author's work. 5. You may redistribute any and all files contained in this package ONLY if they remain unmodified, this user agreement is included and proper credit to any and all authors is given. 6. You may modify and redistribute any and all files contained in this compilation ONLY with the expressed written permission of any and all respective authors. 7. If you do not agree to any of the points above then delete any and all files included in this package as well as past and future versions, by doing this you are agreeing to NOT use, modify and redistribute any and all material that is a part of this package for any purpose. Translation: Do not take my work, use it to make a new skin and then do nothing to acknowledge the use of my work. While it is very flattering to see my work used throughout many other themes and many of you actually acknowledge it in your descriptions (thanks! ), it is quite annoying and discouraging to find "new" skins using my work without a single mention of doing so and in some cases even bragging about all original work made from scratch, please do not do this, all it does is detract me from releasing updates more often. 5. All images and the skin definition will be inside their respective folder (i.e...\LedMirage_Durins_Folk\) if extracted properly. 7. Once in-game, go to OPTIONS then choose "UI Settings" from the menu on the right, once there scroll down to just above the new UI scale sliders to the UI Settings page and you will find a dropdown list where you can choose the UI Skin to use for that character. 8. 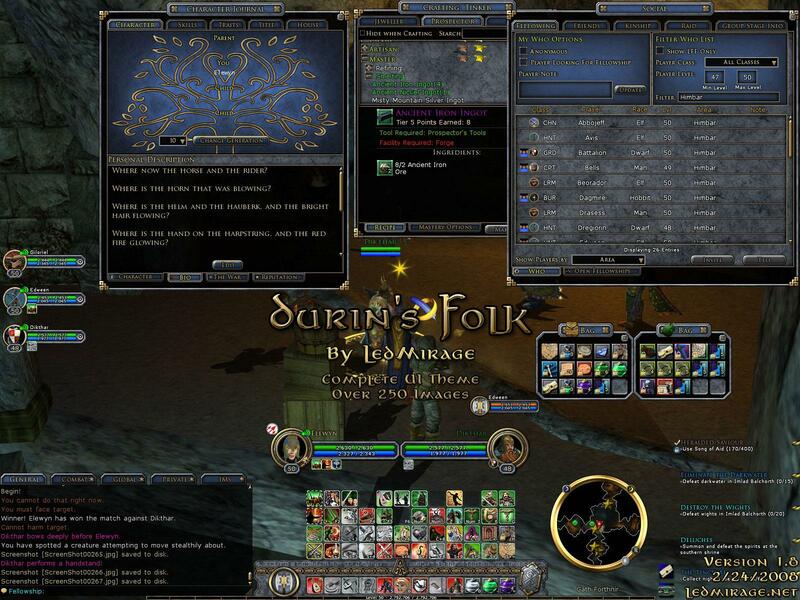 LM Durin's Folk is the standard theme, LM Durin's Folk Black is the standard theme with black translucent backgrounds instead of blue, the mini versions have a more compact main panel which gives you more screen space. Ben & Jerry ice cream, cheese cakes, pizza, pipe weed, fine Dwarven ale and lap dances are all fine donations too. Or... you can mail my Dwarf Guardian "Ledar" in the Brandywine server some ore and gems, those keep the Dwarf happy! 1. Go to OPTIONS, then choose "Quicklots" from the menu on the right, once there you will see checkbox options for each of the five additional Quickslot bars, notice that Bar #1 is NOT the default Quickslot bar, it is the first additional bar. 3. For each Bar Number you wish to customize make sure the DOCK option is DISABLED, docking a bar prevents you from moving it (it goes to it's default position above the standard bar) and prevents using it vertically. 4. Choose the layout for each bar, Horizontal is default, if you want it vertical uncheck the box "Make Horizontal". 5. Exit the options panel. 6. Press CONTROL + \ (that's CONTROL and BACKSLASH) to unlock all screen UI elements. 7. Drag your bars to where you want them. 8. Press CONTROL + \ again to lock all screen UI elements. 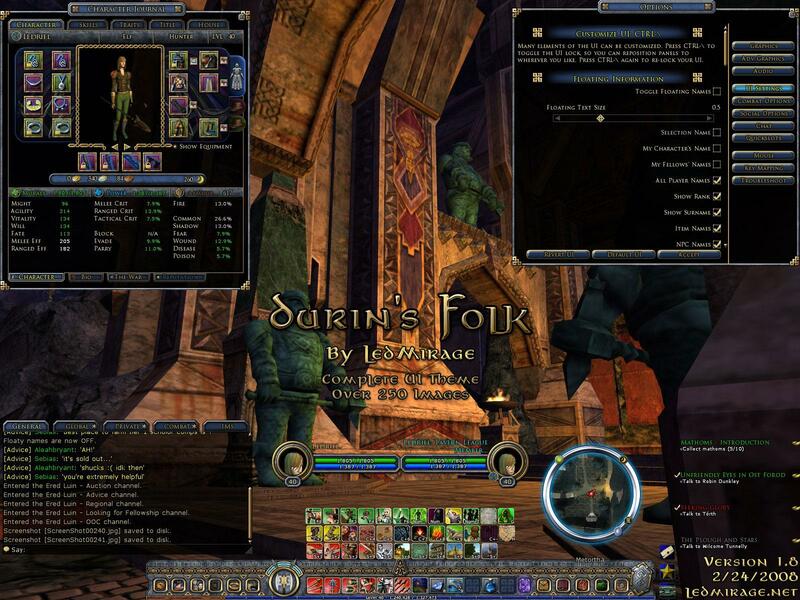 I can also be reached through the official LOTRO forums, my name there is "Zumlin" as well as through www.LOTROInterface.com but my response time tends to be slower. Last edited by Adra : 03-18-2012 at 02:27 AM. 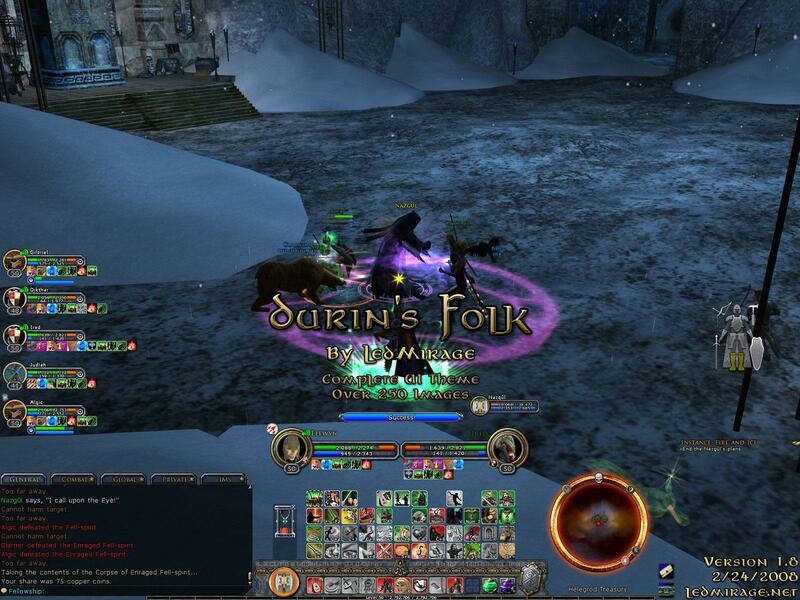 Original LM Durin's Folk hasn't been updated for years. Above link will take you to a skin that is a rework of this great skin. 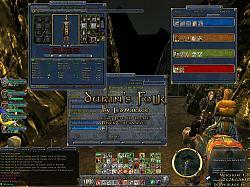 LM Durin's Folk Revisited was released with Turbine's Free-to-Play launch and is compatible with it. Last edited by daimon : 09-13-2010 at 12:41 PM. in this picture there are no toolbars on the left and right side of the quickslots, how to remove them to increases the space there?. I could fix the UI but rather not touch it without LM's approval and I am also enough busy with my own UI project. Perhaps Deewe could look into this as he already updated LM Eorlingas .. or someone else who has time and will. I downloaded this skin but the lm_main_panel_letterbox.tga refuses to change from the original setup. Is this skin compatible with the SoM update yet? If so, can someone help me correct this issue? You can increase the size? LED, thanks for your work! Very slick look & feel. You finally removed that annoying "hump" on the Auto-attack indicator. It interfered with my placement of the chat window. I've despised that design. Keep up the good work! Hope you've found some place that will pay for your skillz. Last edited by Skali : 12-23-2008 at 09:30 AM. I'm having problems with the visual look of your UI. When in Minimalist mode, it don't look right, like Traits and Legendary items buttons remain visible and the rest of the left panel buttons are gone, but appear back if I move the mouse over each. Also, all the bag icons are gone, but if I hover the mouse over they appear back. Is that how it should be? Last edited by StalkerRox : 12-16-2008 at 04:56 AM. Please update this gorgeous skin!! It's the best skin ever, with your Eorlingas. Wicked Mouse: Is your feedback for version 1.8? Pretty much everything you listed was addressed in v1.8, the dark background is as dark as I want it to go since it's a global image used throughout many windows, I have asked my group of friends and family (who had problems reading the quest log prior to v1.8) about the contrast with the text and background in the quest log in v1.8 and they all are happy with it now. I find it quite cool. I'll see what I think after trying it myself later.